Looking for a secret santa gift or a stocking filler for the music lover in your life? Take a look at our suggestions for the books which are guaranteed to bring a smile to their face this Christmas. The inspiration behind one of The Beatles’ finest songs, Tara Browne died young and was immortalised for ever in the opening lines of ‘ A Day in the Life’. Paul Howard captures the life of a worldly individual who embraced the dawning of the swinging 60s with such readiness. A Christmas must-have for fans of The Beatles. Three new musical trends - Rock Against Racism, 2 Tone and Red Wedge - emerged between 1976 and 1992 and, led by artists such as Billy Bragg, Paul Weller, Rhoda Dakar and The Clash, demonstrated the power of music to shape and challenge politics like never before. In this compelling and triumphant account of those exciting times, Daniel Rachel interviews over 150 of the key players to give the definitive history of those crucial sixteen years in Britain's history. A debut novel from a self-confessed Beatles fanatic, singer-songwriter Val Emmich’s heart-wrenching and uplifting story of friendship, grief and hope that will strike a chord with fans of Nick Hornby or Mark Haddon. And, although we don’t like to judge a book by its cover, it’s got John Lennon on the front, so you know it’s good. Over the course of David Bowie’s incredible career, for many fans it’s the Ziggy Stardust era that stands out as his most creative and influential period. But what was it like being at the heart of Bowie’s band at the time? 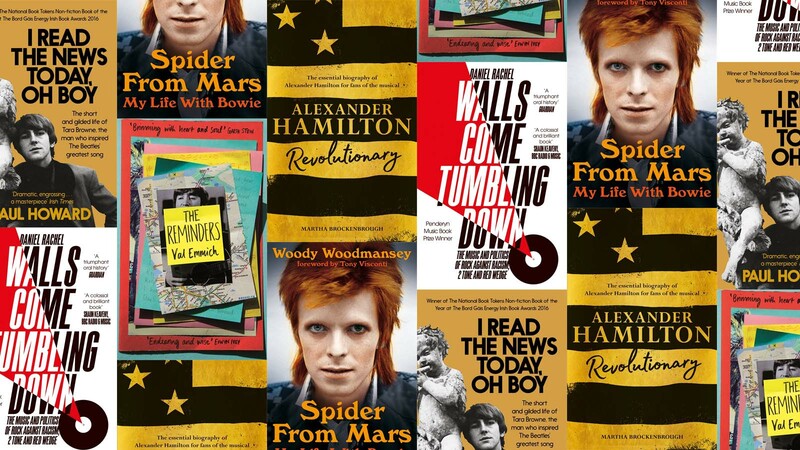 Woody Woodmansey, the last surviving member of The Spiders from Mars, tells the story of his own journey, from a young aspiring drummer in Hull through to performing on four of the most beloved albums of all time, including Hunky Dory and Aladdin Sane. The result is an insightful, funny, poignant memoir that lovingly evokes a seminal moment in music history and pays tribute to one of the most outstanding and innovative talents of our time. It’s the West End show to see in 2018 and has taken Broadway by storm, but who was the man who inspired Lin Manuel-Miranda’s smash-hit musical, Hamilton? Martha Brockenhurst’s new biography tells the compelling true story of Alexander Hamilton’s incredible life and career - an essential stocking filler for every Hamilton devotee (besides front row tickets, of course).